Poll: Did this improve your system? Want to setup LMS for native playback, or double check if you're setting it correctly? Previously I was using LMS that's running on another computer. Now I've moved back to a single machine for LMS and Squeezelite, I've finally done this myself, and to me, this is a positive change. LMS is no longer transcoding wav to flac with 0 compression when streaming to Squeezelite. Seems to sound better with a more organic feel to it. Seems logical, since everything resides on the same single machine, transcoding to flac (with checksum) doesn't really have any extra benefits since it's not really "going the distance". For the future ISO release I'd be implementing this as the default setup now (except for DSD which can do both). (31-Jan-2017, 12:21 PM) agent_kith Wrote: Previously I was using LMS that's running on another computer. Now I've moved back to a single machine for LMS and Squeezelite, I've finally done this myself, and to me, this is a positive change. As you probably know I use a Mac mini as server running LMS or Roon Core. I'm using this as I often use HQPlayer to transcode to DSD 128. This is one area of LMS that I've always had trouble with. I've never been sure from the file settings what is actually streaming. So you are saying that WAV, ALAC, AIFF are all transcoded to FLAC before being sent out via ethernet. Can LMS be set to convert to and stream as WAV to Squeezelite on my Snakoil OS machine? There should be no problem with ethernet speed because DSD streams flawlessly. (31-Jan-2017, 02:20 PM) a.dent Wrote: As you probably know I use a Mac mini as server running LMS or Roon Core. I'm using this as I often use HQPlayer to transcode to DSD 128. See if you get anything. If no results, try just ps aux and look again. (31-Jan-2017, 02:20 PM) a.dent Wrote: Can LMS be set to convert to and stream as WAV to Squeezelite on my Snakoil OS machine? There should be no problem with ethernet speed because DSD streams flawlessly. Yes the walkthrough at the top of the page explains the steps to always use native for each codec. This is something I'd do for the next ISO release also. Not quite sure why it's been converted into FLAC, perhaps this codec is better suited for streaming? I'd do more checks later tonight when I can and check what is running when I'm using WAV and it's streaming in WAV. Hi, I'm trying to figure out if WAV sounds different to FLAC sent to my USB DAC. In LMS file types you can set FLAC to PCM or FLAC decoded as native. Is FLAC decoded to PCM using a different decoder to the native flac decoder? Is FLAC decoded to PCM equivalent to playing a WAV file? Apart from the slight computational overhead of decoding FLAC to PCM in native mode, how could this sound worse than playing the original WAV file? (20-Jul-2018, 09:14 PM) D629497 Wrote: Hi, I'm trying to figure out if WAV sounds different to FLAC sent to my USB DAC. In LMS file types you can set FLAC to PCM or FLAC decoded as native. Is FLAC decoded to PCM using a different decoder to the native flac decoder? Is FLAC decoded to PCM equivalent to playing a WAV file? native: Logitech Media Server (LMS) will send FLAC frames are sent to the Squeezelite client. This client will then decode these with the FLAC decoder. This is when Squeezelite is playing a FLAC file. PCM: LMS wlil decode FLAC files into PCM and send it to Squeezelite. This client will then decode these with the WAV decoder. This is when Squeezelite is playing a WAV file. (20-Jul-2018, 09:14 PM) D629497 Wrote: Apart from the slight computational overhead of decoding FLAC to PCM in native mode, how could this sound worse than playing the original WAV file? Computational time for FLAC is trivial. There is no overhead at all. As for different compression levels, from what I can remember higher compression just takes longer to archive. Playback appears to be the same. This is with a NF9C board, which don't even have a fast CPU. If CPU load is not noticiable on this PC, it will be negligible on almost everything else. Set it such that WAV and FLAC are treated natively. and I think I prefer WAV. So I didn't test decoding FLAC as FLAC or WAV. Instead I tested FLAC => FLAC, and WAV => FLAC. Then FLAC => FLAC and WAV => WAV. And I chose the latter. Need to reframe the problem from "what sounds better/worse" into "what feels more emotional/engaging/[random audiophile jargon]". Instead of trying to listen for differences, or hear what is better or worse. You need to feel for it. I simply relax as much as possible, let the music come to me and assess my physiological responses. <- This is actually a very hard thing to do and it took me a long time to get to where I am now. The answer on how to feel for FLAC vs WAV is relatively simple with the right track and volume. Find some high quality bass heavy track. In my experience the LEF from a WAV track is usually better. I don't understand why. And weirdly, when I play the same track with XMMS - they just feel the same. This makes me think it's not the decoder that is the problem, perhaps it's the players? XMMS is actually the reference player for FLAC, and this is why it's included in Snakeoil OS. This is a very old program and getting this software to compile, let alone work in a modern Linux system took a lot of effort . Would it be better for me to archive all my music as FLAC, and set LMS to decode it to WAV and send it out as PCM? Not in my case as I am a developer and need to assess the SQ when everything is in it's native state. That's one of the references I am using when developing this OS. Users on the other hand are not restricted by this. So here we provide you a good foundation to start with (Snakeoil default install). From there you have free reign to push your limits and find the best way to make music feel good to you. It doesn't matter if it's FLAC, WAV, whatever player, whatever hardware. If you have hair raising on the back of your neck, a sense of excitement, you're on a good start. The one thing I couldn't provide easily is kernel rolling. This means trying various versions of kernels, with different options, patches etc. Do have a rough idea on how to do this but havn't really started earnestly on it yet. Thanks for taking the time to reply so extensively. Am I correct in my interpretation that LMS FLAC => PCM is equivalent to WAV=>WAV? 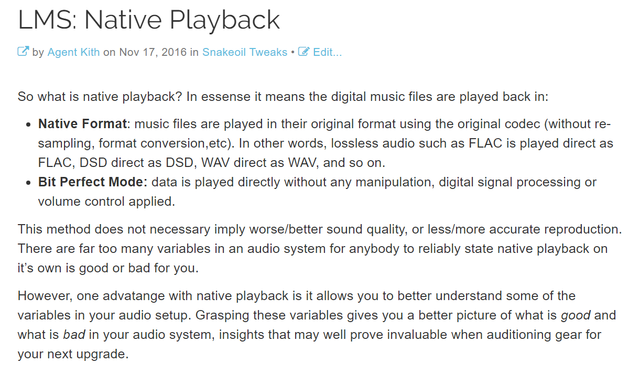 For MPD its Flac=>flac or wav=>wav, no option to convert flac =>pcm? Bottom line is it all sound great and I should just get on with enjoying the music. (21-Jul-2018, 03:42 PM) D629497 Wrote: Thanks for taking the time to reply so extensively. Am I correct in my interpretation that LMS FLAC => PCM is equivalent to WAV=>WAV? I'm not sure about that myself. The thought to compare the above didn't occur to me at the time to be honest . (21-Jul-2018, 03:42 PM) D629497 Wrote: For MPD its Flac=>flac or wav=>wav, no option to convert flac =>pcm? As far as I know, MPD has no such option to speak of (Maybe you can configure this in mpd.conf, but I havn't look close enough. There are two FLAC decoders in MPD, something called libavcodec (if not wrong) and libFLAC. Snakeoil's MPD will be using the latter. (21-Jul-2018, 03:42 PM) D629497 Wrote: Bottom line is it all sound great and I should just get on with enjoying the music. Yup. If you're already on Blind Testing betas make sure to enable CPUSet. That is a great tweak to do. Will do a proper article later when the official version is released. (21-Jul-2018, 03:42 PM) D629497 Wrote: Thanks for making snakeoil OS available, its brilliant! My snakeoil tab has some but not all of the experimental features mentioned, CPUSet is missing? Could this be due to updating to the newest version? Ah, its okay, i found the betas and cpuset, thanks.